Paper HeARTIST: Snow Much Fun! 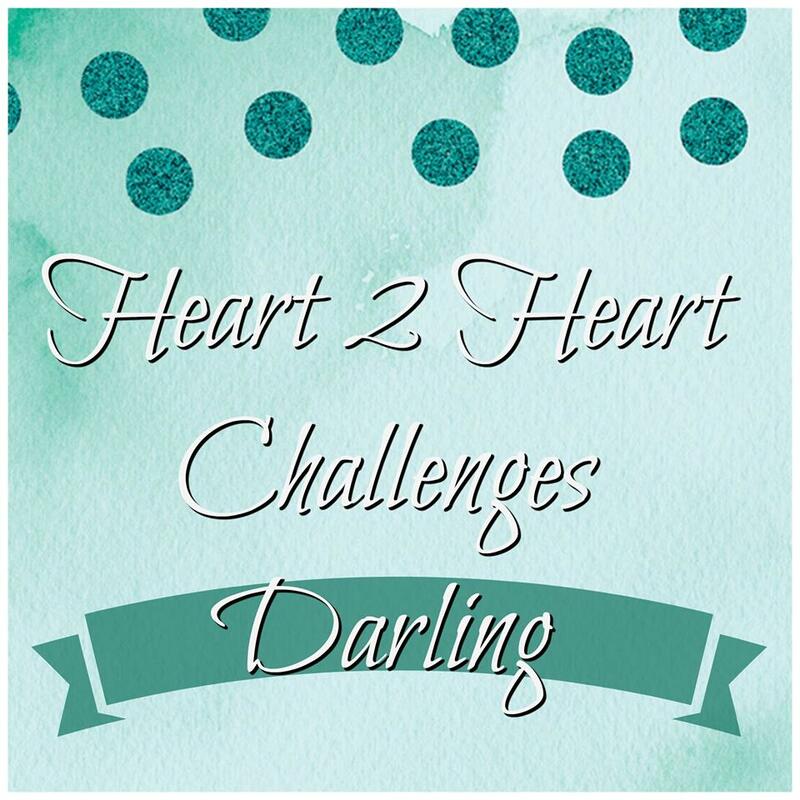 I am so excited to begin my second run with Heart 2 Heart Challenges! 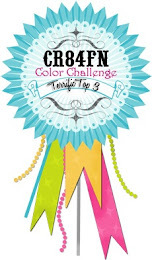 I so enjoyed it the first time and was so happy to receive another opportunity to participate again. Every term at Heart 2 Heart has had a wonderful and inspiring design team, but I'm particularly honored to be among this particular team. This term consists of H2H alumni...paper artists that have served on the design team in the past and who provided so much inspiration the first time that they've been asked back to do it again. I'm still humbled to know that I've been included in this group of talented ladies. Truly! There are 12 design team members in total and we have been divided into two teams. We will take turns posting our projects every other week. The design team that I am part of consists of the following artists: Haley Dyer, Angela Garcia, Carol Labuski, Jody Gustafson, and Lucy Kelleher. The other team (Team B) consists of these artists: Shirley Ross, Allisa Chilton, Jayma Maime, Katy Donaldson Taylor, Melinda Everitt, and Paige Dolecki. If you are familiar with any of these woman, you will agree, this is one amazing line-up! If you're not, please, please, please (I'm not too proud to beg...lol) go check out their blogs. 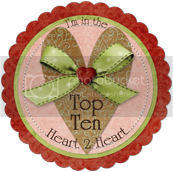 Throughout this term, you can find links to their blogs on the Heart 2 Heart site, as well as in my sidebar. Okay...now onto the first H2H challenge of the year...Snow Much Fun! Think winter, snow, cold, etc. I'm so excited to be able to share my project with you! As great as it looks in pictures, it's "to-die-for" in real life. I saw a hand-made paper star ornament and it was gorgeous! However, it was HUGE! But it got me thinking, how could I get THAT to fit on a card? So I started playing around with my Cricut and cutting different ornaments until I found the right combination. After lots of playing, and frankly trial and error, I finally got it to look the way I wanted. Speaking of items that are retired, and keeping with this month's apparent, but unintended theme of retiring products, I just wanted to mention that the shimmer designer brads are going to retire at the end of this month. So if you like them as much as I do, you may want to pick up a pack or two before Jan. 31st. I had hoped to have a tutorial to go along with this, but time fell short. Once I have it done, I'll come back here and edit in a link to the new post containing the tutorial. If you really, really want to see the tutorial and want to be sure you don't miss it, consider signing up to receive my blog updates by email, that way you'll know when it gets posted. You can find that in the side bar on the left, close to the top. 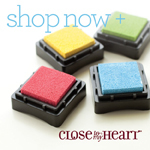 Don't have any CTMH products? That's an easy fix! Simply contact your local CTMH consultant (or go here to find one near you) or you can place an order by going to my website. If you'd like an Idea Book, you can either email me (if you're local) or simply use the Paypal button in the side bar. Now it's your turn. I can't wait to see what you create. Your paper snowflake is amazing! I would have to make one to display (if I ever got up the nerve to try to make one). Welcome back to the H2H DT! I am blown away! This is absolutely gorgeous. LOVE how you used the shimmer trim...so creative. Hoping to play along with H2H this year--welcome back! Oh how beautiful! I am loving how you used the shimmer trim on this! So creative, Tamytha--I absolutely love how you pulled everything together. The stamping is amazing. I have a feeling I will be back to read your blog soon! This is drop dead gorgeous! I can't wait for your video tutorial on how you created it because I totally want to lift your ornament! Thanks Paige! As soon as I'm done with an immediate obligation, I'll start working on it. I'll let you know as soon as I have it done and posted, too. oh.my.goodness, Tamytha your card is simply amazing! The colors are so beautiful together and that snowflake is just stunning - what a gorgeous creation. 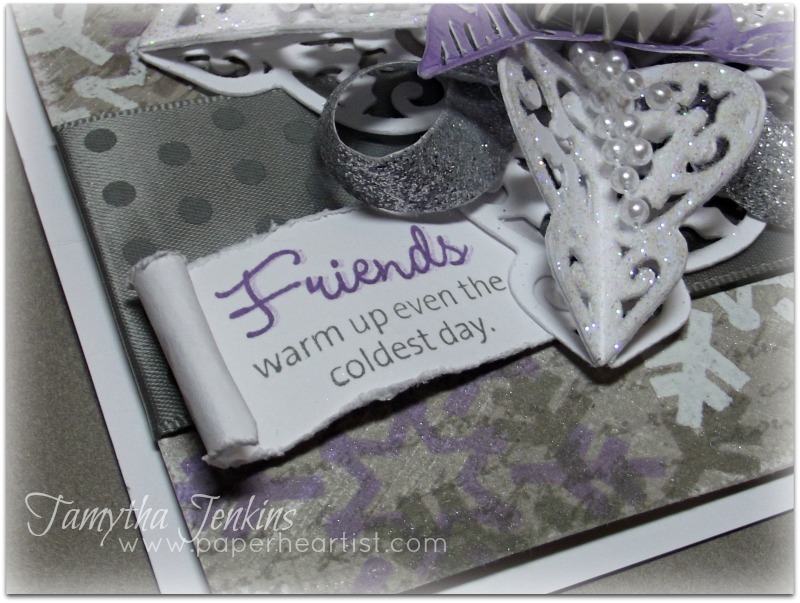 Thanks so much for sharing with us at Frosted Designs - I hope you'll play along again! WOOT !!!! Congratulation on the win! Wow, this is absolutely beautiful - love all the sparkle and shine! 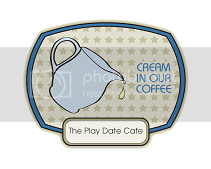 Thanks for playing along with us at Frosted Designs. I just love your art! There's so much detail and I keep finding new and beautiful things I hadn't noticed before like the shadow detailing on, "Friends," and the shimmer trim. Gorgeous! wow wow!!! 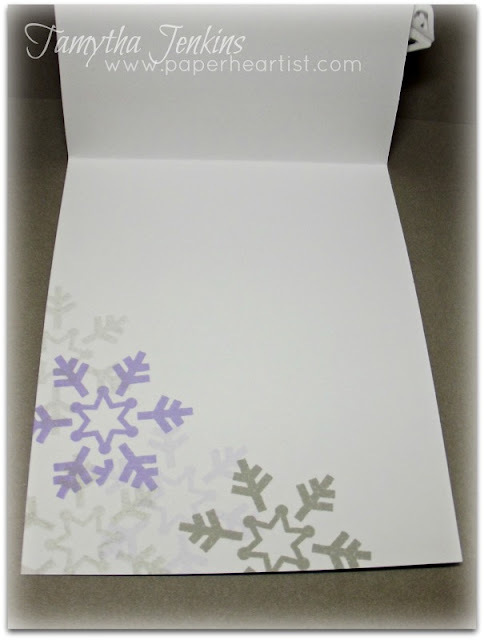 Love your 3D snowflakes!!!! Pretty pretty card!! !thanks for joining us at Frosted Designs. Fantastic job. 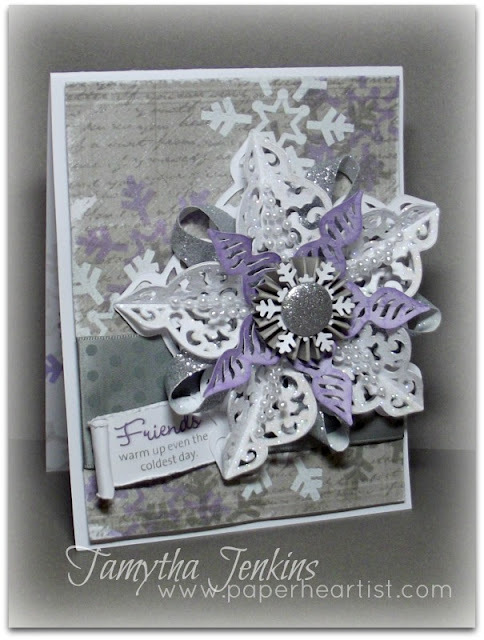 Love this cards colors and the snowflake is out of this world. Gorgeous!!! 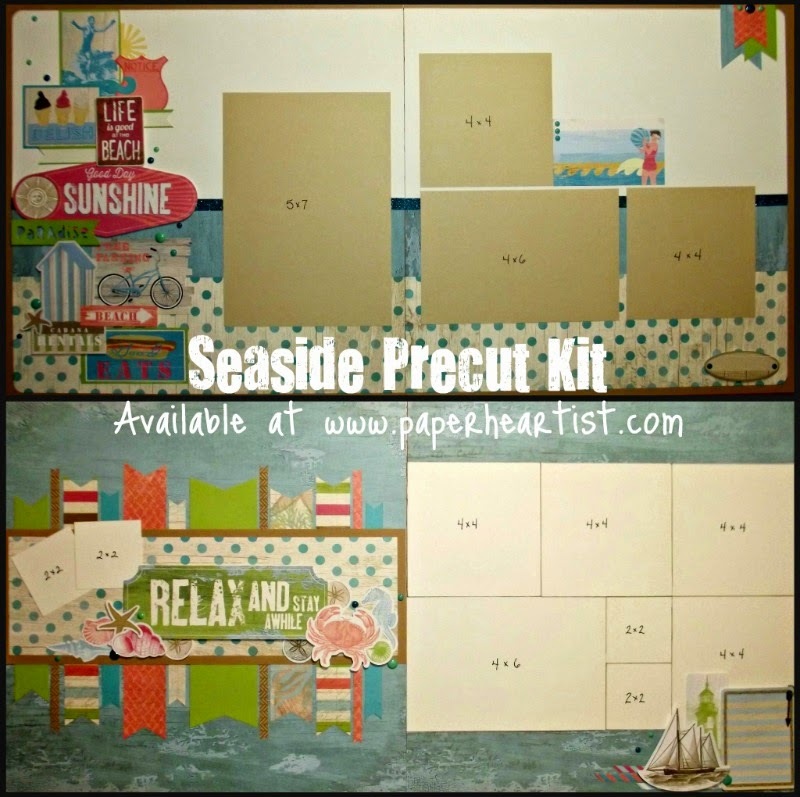 Happily Scrapbooking & Crafting My Memories~Sandra V.
Thanks Casandra! I agree about the brads. I don't usually get too many items that are retiring, as I choose to spend my money on current products, but I can't let these get away. I'll be purchasing a few packs this month. I love them. They so often add just the right touch. I especially like their low profile. Wow! This is beyond gorgeous! So intricate and detailed it's amazing! You card is just stunning!! Wow! Beautiful, beautiful creation!! Win a Set of CTMH Organizers!